This is the third volume of Proust's In Search Of Lost Time. The Narrator's family has moved to an apartment connected with the Guermantes residence. Françoise befriends a fellow tenant, the tailor Jupien and his niece. The Narrator is fascinated by the Guermantes and their life, and is awed by their social circle while attending another Berma performance. He begins staking out the street where Mme de Guermantes walks every day, to her evident annoyance. He decides to visit her nephew Saint-Loup at his military base, to ask to be introduced to her. After noting the landscape and his state of mind while sleeping, the Narrator meets and attends dinners with Saint-Loup's fellow officers, where they discuss the Dreyfus Affair and the art of military strategy. But the Narrator returns home after receiving a call from his aging grandmother. Mme de Guermantes declines to see him, and he also finds he is still unable to begin writing. Saint-Loup visits on leave, and they have lunch and attend a recital with his actress mistress: Rachel, the Jewish prostitute, toward whom the unsuspecting Saint-Loup is crazed with jealousy. 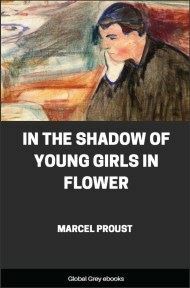 The twittering of the birds at daybreak sounded insipid to Françoise. Every word uttered by the maids upstairs made her jump; disturbed by all their running about, she kept asking herself what they could be doing. In other words, we had moved. Certainly the servants had made no less noise in the attics of our old home; but she knew them, she had made of their comings and goings familiar events. Now she faced even silence with a strained attention. 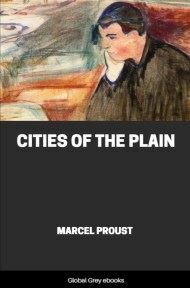 And as our new neighbourhood appeared to be as quiet as the boulevard on to which we had hitherto looked had been noisy, the song (distinct at a distance, when it was still quite faint, like an orchestral motif) of a passer-by brought tears to the eyes of a Françoise in exile. And so if I had been tempted to laugh at her in her misery at having to leave a house in which she was ‘so well respected on all sides’ and had packed her trunks with tears, according to the Use of Combray, declaring superior to all possible houses that which had been ours, on the other hand I, who found it as hard to assimilate new as I found it easy to abandon old conditions, I felt myself drawn towards our old servant when I saw that this installation of herself in a building where she had not received from the hall-porter, who did not yet know us, the marks of respect necessary to her moral wellbeing, had brought her positively to the verge of dissolution. She alone could understand what I was feeling; certainly her young footman was not the person to do so; for him, who was as unlike the Combray type as it was possible to conceive, packing up, moving, living in another district, were all like taking a holiday in which the novelty of one’s surroundings gave one the same sense of refreshment as if one had actually travelled; he thought he was in the country; and a cold in the head afforded him, as though he had been sitting in a draughty railway carriage, the delicious sensation of having seen the world; at each fresh sneeze he rejoiced that he had found so smart a place, having always longed to be with people who travelled a lot. And so, without giving him a thought, I went straight to Françoise, who, in return for my having laughed at her tears over a removal which had left me cold, now shewed an icy indifference to my sorrow, but because she shared it. The ‘sensibility’ claimed by neurotic people is matched by their egotism; they cannot abide the flaunting by others of the sufferings to which they pay an ever increasing attention in themselves. Françoise, who would not allow the least of her own ailments to pass unnoticed, if I were in pain would turn her head from me so that I should not have the satisfaction of seeing my sufferings pitied, or so much as observed. It was the same as soon as I tried to speak to her about our new house. Moreover, having been obliged, a day or two later, to return to the house we had just left, to retrieve some clothes which had been overlooked in our removal, while I, as a result of it, had still a ‘temperature,’ and like a boa constrictor that has just swallowed an ox felt myself painfully distended by the sight of a long trunk which my eyes had still to digest, Françoise, with true feminine inconstancy, came back saying that she had really thought she would stifle on our old boulevard, it was so stuffy, that she had found it quite a day’s journey to get there, that never had she seen such stairs, that she would not go back to live there for a king’s ransom, not if you were to offer her millions — a pure hypothesis — and that everything (everything, that is to say, to do with the kitchen and ‘usual offices’) was much better fitted up in the new house. Which, it is high time now that the reader should be told — and told also that we had moved into it because my grandmother, not having been at all well (though we took care to keep this reason from her), was in need of better air — was a flat forming part of the Hôtel de Guermantes. At the age when a Name, offering us an image of the unknowable which we have poured into its mould, while at the same moment it connotes for us also an existing place, forces us accordingly to identify one with the other to such a point that we set out to seek in a city for a soul which it cannot embody but which we have no longer the power to expel from the sound of its name, it is not only to towns and rivers that names give an individuality, as do allegorical paintings, it is not only the physical universe which they pattern with differences, people with marvels, there is the social universe also; and so every historic house, in town or country, has its lady or its fairy, as every forest has its spirit, as there is a nymph for every stream. Sometimes, hidden in the heart of its name, the fairy is transformed to suit the life of our imagination by which she lives; thus it was that the atmosphere in which Mme. 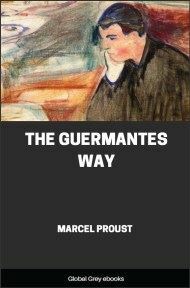 de Guermantes existed in me, after having been for years no more than the shadow cast by a magic lantern slide or the light falling through a painted window, began to let its colours fade when quite other dreams impregnated it with the bubbling coolness of her flowing streams. And yet the fairy must perish if we come in contact with the real person to whom her name corresponds, for that person the name then begins to reflect, and she has in her nothing of the fairy; the fairy may revive if we remove ourself from the person, but if we remain in her presence the fairy definitely dies and with her the name, as happened to the family of Lusignan, which was fated to become extinct on the day when the fairy Mélusine should disappear. Then the Name, beneath our successive ‘restorations’ of which we may end by finding, as their original, the beautiful portrait of a strange lady whom we are never to meet, is nothing more than the mere photograph, for identification, to which we refer in order to decide whether we know, whether or not we ought to bow to a person who passes us in the street. But let a sensation from a bygone year — like those recording instruments which preserve the sound and the manner of the various artists who have sung or played into them — enable our memory to make us hear that name with the particular ring with which it then sounded in our ears, then, while the name itself has apparently not changed, we feel the distance that separates the dreams which at different times its same syllables have meant to us.